Compassion in Action – This brilliant short documentary features the work of the Toronto Feral Cat Coalition and their efforts to tackle Toronto’s massive homeless cat issue. Thank you to EK Park for dealing with this important issue so thoroughly and with such respect. Michelle Nadon and Gervais Vignola, from Rescue Diaries, visited a couple of our all-volunteer run, free TNR spay/neuter clinics. Click here to watch the video for a close look at what happens in one of our clinics and to meet Dr. Hanna Booth and Dr. Joanna Coote, DVM(s), who started Toronto Street Cats in 2010. Rescue Diaries also attended our April 20/16 free feral cat spay/neuter clinic to document what we do and how we work with colony caretakers and trappers to help make the lives of street cats better (click here to see their video). CityTV News filed the following news report shedding much needed light on the continued plight of Toronto’s homeless and feral cats. Click here to watch the report. 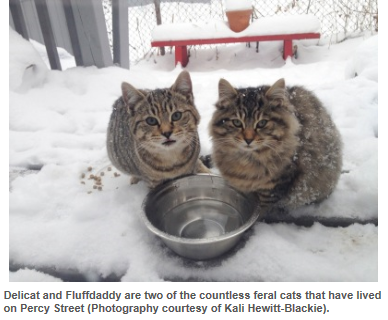 Linda Hermiz, from Sheridan College, writes about the work being done by Toronto Street Cats and our partners in the Toronto Feral Cat Coalition. Introducing the article is the story of the street cats being cared for by one of our shelter building coordinators, Kali Hewitt-Blackie. To read the full story click here. This entry was posted in Upcoming Dates To Remember on May 31, 2013 by torontostreetcats.